The ethanol industry has really only been around for the last few of decades, though in its present state it takes centuries of fermentation knowledge to achieve the same output of ethyl alcohol (ethanol).Today, there are by-products or side-streams, such as distilled dried grains (DDG’s) for animal feed, corn oil and in many cases the recovery and re-use of CO2 for the food and beverage industry. But, unless and until there is an efficient low-cost and low-energy conversion of 100% of the side streams into multiple high value finished products, the ethanol industry with high-debt to equity ratios will be at risk of failure. Survival on low single EBITDA margins is not a success. It is deferring the inevitable slow drip demise of the industry, much like shale-oil. The inefficiency lies in the low value of CO2 compared to the cost of processing 50% of the sugars that go through the fermentation process. Most of the CO2 is lost to the atmosphere. Likewise the high energy consumption of drying the distilled wet grains to produce DDG’s reduces the efficiency of the refining process. The only reason that 80% of the ethanol industry exists is down to the renewable fuel standard (RFS). It is the most efficient and cost effective octane additive in the motor industry, but without the requirement to add a minimum of 10% to the gasoline in the tank it is unlikely that the oil industry, refineries, would see this industry as viable on the scale it currently produces at. A high corn crush margin ethanol production plant would transform the industry. So much has been made of the need to diversify and reduce the reliance of ethanol alone. Developments such as DDG’s, Corn Oil and even CO2 go some way to achieve this goal. However, this is simply not enough to ensure a reasonable return on investment and cover investment needed to maintain and upgrade for future longevity of the industry. 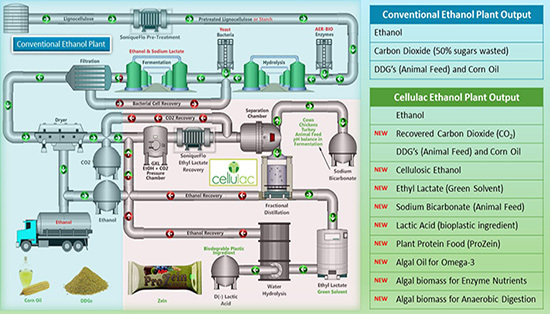 The route to Cellulosic Ethanol is a long hard slog with high cost of Capital Expenditure along with low sugar content of biomass and its higher cost of extraction. There is 60 to 65% by weight, dry matter of C5 and C6 sugars in corn stover and wheat straw. In principle the low cost of biomass, in this case corn stover and/or wheat straw is viable. In practice, the cost to access and convert into ethanol is much higher because of the higher energy necessary to extricate the polysaccharides (sugars) from the corn stover. In addition, multiple types of sugars require multiple enzymes or enzyme cocktails in preparation for fermentation to ethanol and CO2. It is not enough to incrementally increase the already tiny margins with single piece add-ons. Increasing the yield by changing an enzyme or bacteria or undertaking a long term investment to add less than 10% to the crush margin still does not justify the loss of 50% of sugars to the atmosphere in the form of CO2.